It’s no secret that children love water, especially when playing in the hot summer sun. At Apple Montessori Schools Summer Camp, not only do our classrooms offer water games like “Practical Life’s Fishing Game” or the “Sink of Float” game, but swimming lessons are also one of the many life skills we can help guide your child through. Children are eager to learn, and we provide a relaxed and safe environment for them to do so. Our pools are designed for young swimmers and are heated. We understand that it is important to teach a child to swim at his or her own level. Our highly skilled, highly trained staff is Red Cross certified. Our lifeguards and swimming instructors will teach your child how to be safe in and near the water. Montessori swimming lessons embody the fundamental teachings and philosophies of Apple schools while also giving children time to hang out and socialize with their friends. This form of socialization and learning helps build confidence and independence within campers. Our daily lessons are designed to build upon each child’s individual skills and abilities. 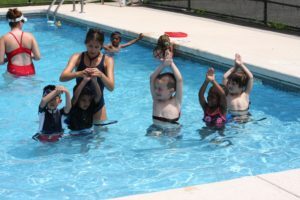 Our lifeguards and aquatic instructors use a Red Cross Learn to Swim Program in conjunction with Apple’s unique approach to foster each child’s swimming abilities and pace. Our lessons cover six levels of swimming from Level One: Acclimation to the Water for our youngest campers, to Level Six: Advanced Aquatic Skills and Stroke Proficiency. Our youngest campers are given safety bubbles, which are eventually removed as their skills develop. Games and positive reinforcement are also integral parts of our swimming lessons. Campers are recognized with awards and certificates for reaching milestones throughout the summer. Parents are also kept in the loop with weekly written updates, and ultimately, a report certificate. We will never pressure your child into doing something they’re not ready or comfortable to do. Montessori swim lessons aren’t just about learning a valuable skill, they’re also about making it fun! Please see your Campus director for the specifics to your location as swimming lessons may vary.